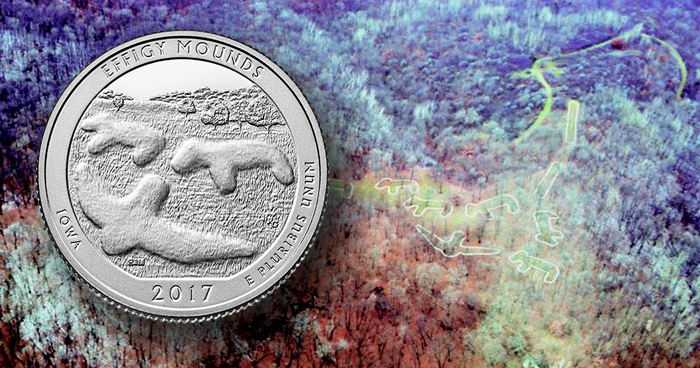 Technically speaking, the 2017 Effigy Mounds National Monument quarters have already been released, since they’re part of the 2017 America the Beautiful Quarters Proof Set made available for purchase at noon on January 5. As an individual design, however, the Effigy Mounds quarters have quite a few steps to go in the traditional Mint-release cycle. The first steps take place on February 6, when the bags, rolls, and boxes become available at noon on the Mint’s website. That evening, the Mint will host a coin forum at the Effigy Mounds National Monument Visitor Center in Harpers Ferry, Iowa, from 5:30 to 6:30 p.m. Members of the public are encourage to attend the forum, where they will learn about upcoming Mint coin programs and initiatives and will have a chance to express their views about future coinage. The following day (February 7), the United States Mint, in conjunction with the National Park Service, will hold the official launch event. Taking place in the Allamakee Community School District High School Gym (1059 3rd Ave. NW, Waukon, IA), the launch will commence at 10 a.m. CST. After the ceremony the Mint will hold its customary exchange program, in which visitors can trade their cash for $10 rolls of newly minted Effigy Mounds National Monument quarters. The minimum purchase is one roll ($10); the maximum is 10 rolls ($100). Both the coin forum and the launch event are free, but prospective guests are reminded to bring cash if they wish to participate in the quarter exchange. For additional information on these events, click on the banner below.